An ancient coffin site is discovered in Cambodia’s Koh Kong Province, estimated to be about 500 years old. Judging from the pictures the coffins look like they were hewn from whole logs – and such coffins are quite common throughout Southeast Asia. 04 september 2007 (Vietnam Net Bridge) – An ancient tree-trunk coffin, found in the Quang Tri Province of Vietnam, is donated to the local museum. The coffin is said to be the material culture of either the Malayo-Polynesian people or the Mon-Khmers who operated in the area 700 years ago. 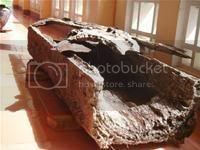 The Quang Tri Museum has recently received an ancient coffin made from a tree trunk, according to the museumâ€™s director, Mai Truong Manh. The coffin was discovered on August 28 in Trung Chi village, Dong Luong ward, Dong Ha commune at 1.2 m underground when local residents were digging for the construction of an electricity post. 4 April 2007 (Bernama) – 700-year-old timber coffins found in Sabah, a whole lot of them, from a period where little is known about Sabah and Borneo. The coffins are said to have some similarities with those found in China and Vietnam, which is plausible as Borneo rested in the middle of trade routes between China and Island Southeast Asia – some Chinese accounts also report of Chinese communities living on Borneo. Lembah Kinabatangan, located in Sabah’s central region, is not only renowned for its vast oil palm plantations. The valley is also the resting place of priceless treasures in the form of “timber coffins”. It is believed that about 2,000 timber coffins, some as old as 1,000 years, dotted the Kinabatangan Valley, making the area one of the nation’s important archeological sites. Many of the coffins, made from hard wood like belian and merbau, are found in several caves at the valley. Among the caves is Agop Batu Tulug in Kampung Batu Putih, Kinabatangan, turned into an archeological site by the Sabah Museum Department on July 6, 1995. The Sabah Museum authorities, with collaboration from the National Museum and Universiti Sains Malaysia (USM), are now carrying out restoration works in efforts to conserve the timber coffins found in the valley. A collection of working tools from the paleolithic and neolithic eras, pottery and jewelry, trunk tombs, and many valuable photos and scientific documents on the Lung Leng site are also being displayed at the showroom, which will be open until November.